Discover Acapulco's historical heritage, visit the Chapel of Peace, the Fort of San Diego Museum and see Diego Rivera's Mural. Lastly, watch the amazing cliff divers show; you will also make a stop for shopping. You will be transferred from your hotel to the Fort of San Diego. Pick up time will vary depending on the location of your hotel. You will then enjoy a guided visit at the Fort of San Diego, built in 1616 by the Spaniards to protect the port from pirates. It's the most important maritime fortress on the Pacific! The museum exhibits Acapulco's History and the cultural interchange with East. Then, you'll pass by the Main Square and the Cathedral heading towards Diego Rivera’s Mural, created by the Mexican artist on the Front Facade of Casa de los Vientos, owned by the famous art collector and Diego's muse: Dolores Olmedo. Its a beautiful Mural dedicated to Quetzalcoatl. Then, head to Silver Shop if you'd like to do some shopping before you are taken back to your hotel. 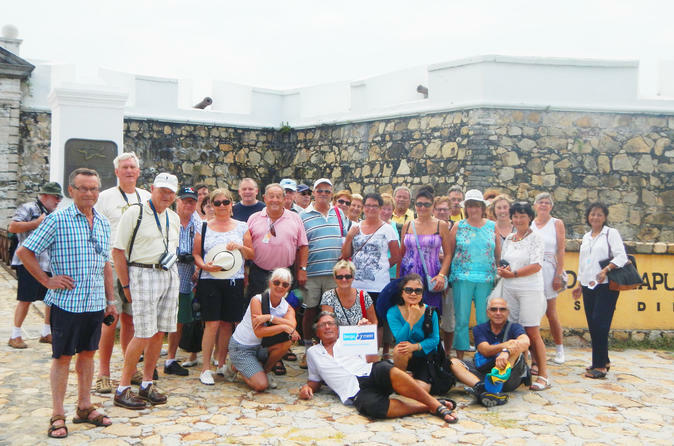 Note: This tour is also offered separately as a shore excursion tour on the website.